I am a sucker for a good potato dish. I could eat potatoes every night of the week! They are so easy to make and you can fix them up in so many different ways. This recipe has a totally different taste than most of the potato dishes that I make. I think it is mostly from adding freeze dried sweet corn and our awesome THRIVE Chef’s Choice Seasoning. The possibilities are endless….mushrooms, ground beef, squash! 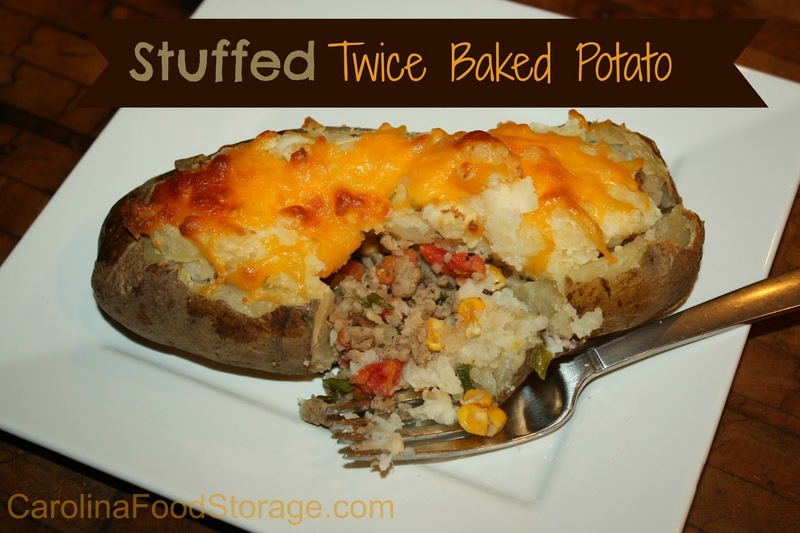 I can’t wait to make a few more stuffed potatoes. Preheat oven to 450 degrees. Scrub one large potato and wrap in tin foil. Bake for 40 minutes then remove from oven. Meanwhile combine above ingredients with 1/2 cup warm water for 10 minutes then drain. Cut the top of the potato off and hull out potato. Combine a desired amount of sour cream with potato. Pack potato with meat and veggie mixture then top with potato mixture and a layer of shredded cheese. Bake for an additional 10-20 minutes.